Booming Waterfront and Rail development, but oh the Controversies! 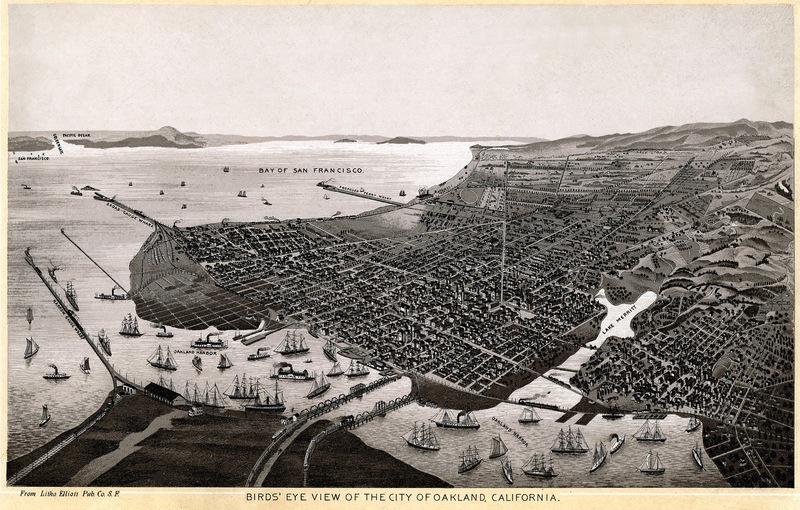 The California State legislature incorporated the town of Oakland on May 4, 1852. 30 mayors, thus changing of the political powers that be was in effect the nature of the growing communities civic engagement. Incorporated in 1854, Horace W. Carpentier became Oakland's first elected mayor in an election where his 364 votes cast out-numbered the official voting population of the town. Thirteen days later, Mayor Carpentier, obtained the exclusive use of the Waterfront, a matter that lingered for a period of thirty years, and resulting in a never ended contentious wrangling for control over the evolving and increasingly valuable real estate, rail and shipping interests. In 1855, in reaction and outrage to Carpentier's land grab, he was expelled from the office of mayor. A lengthy court battle then ensued over ownership of the Waterfront. Suffice to say that all the power players were engaged, fighting with everything they had, railroads in particular leading the charge over access to what now obviously prime real estate as the Transcontinental railroads were envisioned to forge across America. This massive railroad wharf and ferry pier, located at the foot of Seventh Street, was acquired and extended by the Central Pacific Railroad in 1868 to transport freight to San Francisco. It served as the western terminus of the first Transcontinental railroad when it was completed in 1869. The Long Wharf connected to ferries that carried commuters and cargo to and from San Francisco. Part of the wharf was filled in between 1879 and 1882, creating a mole. It remained in service until 1958. In 1868, the possibility that Oakland might be selected as the western terminus for the transcontinental railroad brings the dispute with Carpentier to a head. Carpentier agreed to deed his rights to the Oakland Waterfront Company, however, later it was discovered that Carpentier was in fact the President of the Oakland Waterfront Company. The Central Pacific constructed the Oakland Long Wharf at Oakland Point, the site of today's Port of Oakland. The Long Wharf served as both the terminus of the Transcontinental Railroad as well as the local commuter trains of the Central (later, Southern) Pacific. The Central Pacific also established one of its largest rail yards and servicing facilities in West Oakland which continued to be a major local employer under the Southern Pacific well into the 20th century. Oakland Formation in 1854 story i have been read carefully. The formation process was really great ..
You have been use the image of the 1854 Oakland Formation ....That was interesting.